Having a great office machine for your business can be crucial. It can be frustrating and expensive if you are forced to run out of the office to go to a print shop every time that you need something done. However, getting on a new copier lease isn’t the right option for everyone. Getting a great deal on a used copier can actually be a great way to meet your print and copier needs without going over budget. Many people feel as though they want to steer clear from a used copier. They are concerned that they are going to get stuck with problems that someone else didn’t bother to fix. This isn’t a concern with our leasing group. We do whatever we can to make sure that our machines are in great working condition. We want to be sure that you walk out of our shop with an option that works great for you. All of our machines are received from responsible businesses that took great care of their machines during their previous leases. We then have all of our machines looked over by our team of amazing technicians. This two step process helps to make sure that your used office copier is going to be in great shape when it arrives at your workplace. 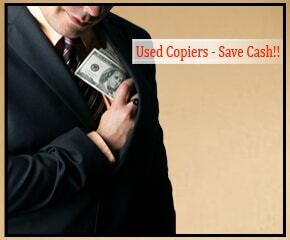 Getting a great deal on a used copier is an amazing way to get the machine that you need without the cost. Used copiers give people who otherwise wouldn’t have been able to get an office copier the opportunity to help their business like never before. Reach out to our amazing team to learn more about getting a great used office machine for your business today.